While it seems to be universally the case that authors would rather have their books written about than not, it is also the case that it is sometimes better not to review a given book than to review it. That sometimes the very methods employed in reviewing a given work—a consideration of character creation, narrative drive, pacing, beauty of language or a lack thereof, etc.—seem to point out only flaws and actually serve to downplay a given work’s virtues. 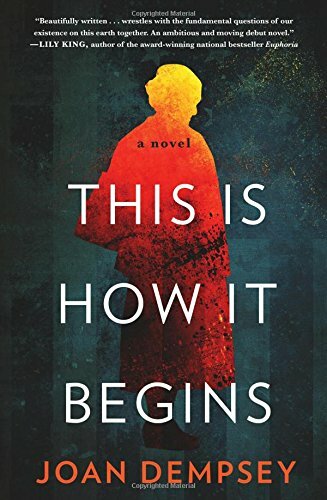 Such is the case with Joan Dempsey’s debut novel This Is How It Begins, a novel whose ripped-from-the-headlines nature, exploring as it does our present-day Great American Culture War, which in this case, as all too often in our actual lives, pits conservative Christians against homosexuals. This is, of course, a subject well worth exploring, both in life and in art, but here, instead of being the living, beating heart of the novel, it is its weakest organ, with shallow and predictable characters saying and doing rather predictable things. So let’s not review this book. Instead, let’s just discuss it. Because it is worth discussing. And because it is also, in parts, truly artful. And, in parts, splendid. And, in the end, it is also an important work. Several aspects of the book contribute to its importance. Its topic, of course, but also the way in which the central conflict is intertwined with something larger, with the idea presented as to how evil reveals itself, and just how it is that “it” begins. The most essential aspect of the book, however, is a character that author Dempsey put very neatly upon the page, but who refuses to stay there. Her three-dimensionality defies the flat, paper plane. She is one Ludka Zeilonka, an 85-year-old art professor emeritus at a small New England college, having come to this country from her native Poland in the years following World War II. This brief bit tells us a great deal about our author. It shows that she is able to tell us so much of what she wants us to know with such an economy of language. Indeed, the whole of This Is How It Begins is pretty much cut-to-the-chase. In spite of its nearly four hundred pages, it is a pretty lean machine. This works both for and against the novel. On the one hand, the pages seem to turn themselves. On the other, more development, both in terms of character and plot, would have yielded a greater result. Ludka, as I said, is an elder of her tribe, a respected, even beloved educator and expert on art of the World War II era, who is married to Izaac. He is Jewish, she is Christian and a member of the Catholic Church. That’s just a detail, but an important detail. Izaac had, until he retired, been the state’s attorney for Massachusetts. Their son, Lolek, is, as the author puts it, “the most powerful state senator in Massachusetts.” Their other son, Frank, is a fire chief. So the family is connected politically and money never seems to be an issue. And there is, among them, an unspoken entitlement that sadly undermines what might have been a more honest, churning of ordinary people in extraordinary circumstances. Lolek’s son Tommy teaches high school in the local district. Although his family does not yet know it, he has just been fired. This recitation of the titular concept is only the first of several. This leitmotif will serve, like breadcrumbs scattered about in a children’s story, to guide us through the whole of the story, never quite clumsily, but nearly always more obviously than one would prefer. Sadly, it is also the truth. This is how it always begins, with a rude, lout creating a stir, telling a gay man that he has no right to share communion with others. Or a red-faced blowhard who attempts to intimidate immigrants. Or white guys with tiki torches parading around a Confederate statue. As the book ultimately points out, it never starts with death camps. So Tommy and a group of other teachers across the state have been fired on the same day. The thing that they all have in common is that they are lesbian or gay. And yet, the schools insist that that is not the reason they were let go. They are instead charged with having shown bigotry against children from Christian families and have been forced to read literature that flies in the face of their beliefs. In other words, religious freedom is at stake. A radio talk show host (with a show called “Tell It Like It Is”) mixes in, as does a minister of what seems to be some sort of religious franchise with groups of congregations apparently throughout the land, all of whom march in lock-step in a cause whose necessary outcome seems to demand the dehumanization of homosexuals, and the loss of their basic constitutional rights. Thus, Tommy walks through the book with a target on his back. He endures personal violence, threats, property damage and stress to his marriage to husband Robert. Tommy is seen arranging the hors d’oeuvres that he made on a silver platter or being shushed by his lawyer, father and grandfather every time he tries to speak. Or he is completely unconscious in the hospital, which is where the nurse gets out that Steri-Strip . . . Even less developed is his husband, who gets to be a lawyer and to think lawyerly thoughts in a lawyerly manner. And Meck, that talk show host and his wife, whose name I forget, because she is so easily forgotten in that all she does is shush the children. And on and on. The narrative is ripe with characters who can be described with a single adjective. Poor Tommy. Loyal Robert. Misled Meck. Our author, in her zeal tell her admittedly important story, puts narrative over characterization, with the result of making what should be complex morph into something sadly simplistic. And this is nearly where it ends. It is the final repetition of the title, when all the chips on the Plinko board fall into the right slots. The parts of the novel that are in her—Ludka’s—hands are truly artful and wonderfully wrought, especially the scenes in which she, after a lifetime away, returns to her native Warsaw. That they outweigh and overwhelm those Lifetime movie sections in which the religious right turns out to be just as nasty and deceitful as they always turn out to be (arguably in “real life” as well) is all to the good. Because it is all too rare that a character creates the visceral impact upon the reader that Ludka does. And that a character of advanced age is seen as something other than a victim herself, requiring sacrifice and constant care from all those around her. But one wishes that Joan Dempsey had been unwilling to surrender her manuscript to her publisher until such a time that her every character stood as tall, as strong and as meaty as Ludka and that our author had been less enthralled with tossing around mysteries throughout her text and then solving them one and all, and, instead, had worked harder at capturing today’s cultural realities, just as fervid as they may be, and left tying things all up in ribbons to other, lesser writers. Too much of the novel adds up to nothing—the theft of a priceless painting, a radio show debate, a press conference. And too many characters are chess pieces and not human beings. But still, it’s shocking to learn that This Is How It Begins is Dempsey’s first novel. No matter her experience as an author of other things, and, apparently, as a teacher of creative writing, her pulling off as much as she does in these pages shows her to be an author to remember and to expect even more from in the future. I want to tell you that This Is How It Begins is a tremendous success. But, honestly, I can’t. What I can tell you is that it is worth buying, worth reading, and worth thinking about afterward. It is the rare book published today that is about something, by and author who cares enough about her work to wear her heart of her sleeve. And that is success enough, that for it our author Joan Dempsey is to be heartily congratulated.